Planar magnetic tech downsized for your ears. Audio company Audeze has unveiled and is showing off its new product, the iSine VR Headphones, at CES 2017 this week. 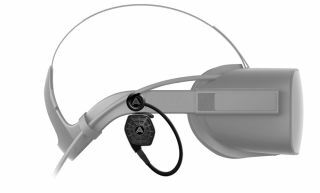 They're a pair of in-ear headphones which, thanks to some fancy tech, Audeze says will make for a "more realistic VR experience." The iSine VR Headphones use Audeze's planar magnetic technology, which is normally found in large, studio-quality headphones. However Audeze has developed a smaller version which it debuted last year. Now, the tech has made the jump to the iSine VR. Unlike most headphones, planar magnetic technology uses magnets rather than a voice coil to move the membrane as a whole, and in theory, this delivers a more natural sound. Audeze boasts a wide soundstage, lower distortion, and accurate bass - flat to 10Hz. The iSine VR Headphones work with the HTC Vive, the Oculus Rift, Sony PlayStationVR, and StarVR headsets. They're due for release later this month at a price of $399. That's a fairly low price for planar magnetic headphones, but it's still fairly hefty, so we'll have to wait and see if it's worth it when they hit the market. Tuan is going to check them out at CES later today, so come back this evening for his thoughts. Update: Tuan here. I got the chance to try out the iSine VR in ears and they sound amazing. True planar-magnetic in ear monitors that deliver real high-end sound, and amazingly deliver audio that sounds like it's in front of you rather than inside the middle of your head. The iSine VRs are snap-in replacements for what's on the Rift, which makes things easy. Definitely a huge step up from the new in-ears that Oculus is now selling. They sound competitive to the best headphones I've tested. Excited to get a sample in to really test them through my rig.